K College builds a new virtualised data centre with APSU. K College is one of the leading education centres in the South East, with over 300 full time and thousands of part-time students. Exciting plans are underway to rebuild the college’s Brook Street campus in Tonbridge. The new ‘Campus 21’ project is estimated to cost £60m, and will represent the most significant development of any educational institution in the history of the West Kent region to date. The vision is to develop a high quality, contemporary, flexible learning environment for students well into the 21st Century. K College were looking for an experienced IT solutions provider to help them deliver the IT infrastructure for their new campus. They wanted an infrastructure that was mobile, flexible, reliable, and used leading technologies to reduce the cost of ownership and deliver a greater return on investment. The existing data centre hosted multiple Dell Servers running Windows 2003 Server with over 1000 applications used across both desktops and servers in the campus. The first planned demolition & rebuild would involve the building in which the data centre resided, so a new data centre was needed to ensure service continuity during the redevelopment and for the new campus infrastructure. The new data centre was smaller than the existing facility, and subsequently consolidation of the college’s server infrastructure needed to be considered. Improve their disaster recovery plans to ensure maximum service availability to the campus. Improve the agility of the IT department through the ability to easily provision new servers for applications. APSU was selected to assist K College with the development of their new data centre, providing a server consolidation and virtualisation solution using IBM System x and System Storage to provide a suitable infrastructure for the migration to a virtualised server environment. Using VMware VI3 Enterprise, APSU was able to consolidate multiple production servers to several IBM x3650 servers, providing a smaller data centre footprint along with scalability for future growth requirements. The x3650 is ideal for virtualisation due to it’s highly scalable features such as dual processors with quad core capability, as well as extended memory support. These features enable the x3650 to achieve large server consolidation ratios in a virtual server environment. APSU recommended the IBM DS4700 Storage array to cater for the storage requirements of K College. This was key to the performance and future scalability of the new infrastructure, and was ideal to provide the backend storage requirements of VMware ESX 3 Enterprise. APSU designed the storage solution to cater for multiple types of data, and the IBM DS4700 allows K College to migrate data to dedicated tiers of storage as it transitions through the information lifecycle. This provides the college with the ability to archive data to lower cost storage as it is accessed less frequently and means that primary fast tiers of storage remain utilised for the most demanding applications and services. The new infrastructure was designed to achieve maximum performance and utilisation, together with VMware ESX Enterprise 3 which includes key functionality such as, VMotion, Dynamic Resource Scheduling (DRS), and High Availability (HA). With these features APSU was able to provide K College with a virtual server infrastructure that is both dynamic and intelligent in managing available resources, whilst facilitating a high availability solution with in-built resilience, providing K College with a solution that caters for both current and future demands with the required levels of availability. 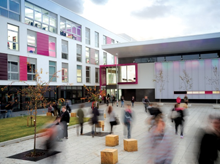 The new infrastructure has provided K College with the flexibility and scalability that it requires for the future, whilst ensuring minimum downtime and maximum return on investment. Through the consolidated infrastructure they have been able to realise substantial cost savings through a lower cost of ownership on the new data centre, and reduced energy costs for powering and cooling the IT systems. The new infrastructure has a significantly smaller server footprint, allowing them to house all their IT equipment in the new data centre with capacity for future growth. In addition the new infrastructure is now delivering greater performance, reliability and resilience, providing the college with a stable, highly available platform on which to deliver the required IT services. The centralised management and consolidated infrastructure will enable the college’s IT department to be more proactive and better equipped to meet the ongoing operational and functional demands of the staff and students.